The Icon That is Uli Jon Roth - Welcome To All That Shreds Magazine! Uli Jon Roth has had an amazing musical career which comprised over 40+ years of dominance in the rock guitarist’s music industry. He had been an icon for all the metal guitarists and the younger generation. What a magic he has in his fingers which bends the strings in such a way that it emanates breathtaking tunes from his fingertip. Don’t you believe? Trust me, listen to this The Sails of Charon – from the album and feel how master this man is in playing the intricate nuances of the guitar. Being a German guitarist, at a very early age, he became famous after taking the charge of Scorpions as lead guitarist. It was a very sudden decision when two lead guitarists of Scorpions band (at that time) left the band for joining UFO. Then the remaining band members merge with them to in order to sustain the band. Uli Jon Roth had a band with the name of Dawn Road at that time which he had to end the existence of Scorpions. In reality, Scorpions gave him more space and chance to explore himself as a lead guitarist, songwriter, and occasional singer. ‘Tokyo Tapes’ was there major hit, which was recorded in Japan and sold nearly 1 million copies all around the world. By 1978, he left Scorpions and formed his own band by the name of ‘Electric Sun’. He released three albums through this band and all of them were dedicated to renowned public and social personalities. Then, later on, he started a new phase of his music journey as a solo career in which performed at various concerts such as at London Wembley Arena in 1998, Castle Donington in 2001, Wacken Open Air festival in 2006, Rock am Ring Festival Germany in 2007 and 2008. All of these concerts were mega hits and were leased on DVDs as well. In the meanwhile, he also worked on his exclusive full-length studio album as well named as ‘Under a Dark Sky’ and released it in 2007. Recently in 2015, he released a studio album by the name of ‘Scorpions Revisited’ which was recorded in Germany. The special thing about this album is that he added all his personal favorites from old Scorpions songs. This album was a huge success which led to a world musical tour as well for the electrical rock band music. 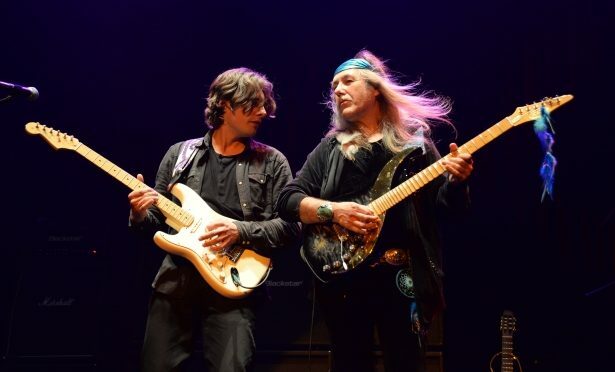 After seeing this success and getting a too much positive response from the audience Uli Jon Roth initiated a second tour named as ‘The Ultimate Guitar Experience’ with his previous fellow guitarists. This tour again had a much positive feedback and response from the critics as well. Nice piece… very cool spin.